Keen-eyed gamers might recognise Giana Sisters: Twisted Dreams as 2012's Kickstarter-funded platformer, Project Giana. Developed to mark the 25th anniversary of Giana Sisters, it brings the pair into the 21st century. The game takes place a little further down the road than the originals. Giana, now a teenager, is pulled into her dream alongside her sister Maria. This dream is not going in their favour, however, and the pair are separated. Giana's not the girl she used to be. She's not so afraid of her nightmares any more, and the sugary-sweet dreams she used to inhabit no longer hold the same appeal. 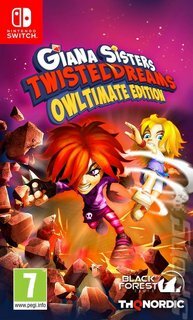 This is where Giana Sisters: Twisted Dreams gets its central gameplay mechanic. Giana keeps slipping between a dark, nightmarish dreamworld and one that's all sweetness and light. 'Cute' Giana dances and twirls her way through a world of demons, while 'Punk' Giana brings a fire dash and aggressive style to combat sunshine and cutesy owls. Players can slip between the two worlds on the fly and doing so isn't just an option - it's essential. The worlds mirror each other, so players will need to switch between the two to figure out the best way to overcome obstacles using their different abilities. Punk Giana might need to dash and bounce off walls, for instance, or Cute Giana might need to glide through the air. While it's possible to run and jump right through the game at a fair clip, there's also plenty of scope for those who like to linger a little more over a level. Stages are huge, and there are plenty of crystals (and giant mega crystals) to collect, and getting them all will require a lot of strategy. There's even a local player versus player mode that pits up to four gamers against each other in aggressive speed runs. With the Owltimate Edition gamers get not only the base game, but also all existing DLC and five brand-spanking new levels!